For those of you who recall my recent review of the Elemental Designs A2-300 subwoofer, youll remember that Elemental is a small, seven-year-old firm in Newton, Iowa, that makes a range of car- and home-audio products. I thought the A2-300 a fine product -- and a heck of a value. Elemental sells its products via the Internet and phone consultation. Marketing director Brett Bell told me that the firm strongly believes in a one-on-one approach to ensure that any ED system sold is the best match for that customers room and associated equipment. 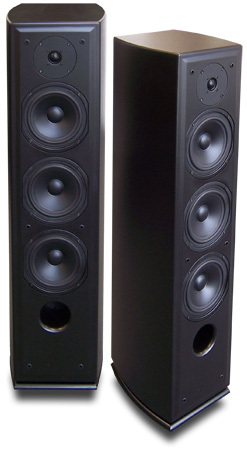 The Elemental Designs A6-6T6 ($500 USD per pair) is rather small as tower speakers go, at 40"H x 11"W x 12"D -- at least, my 48"-tall NEAR 50Me Mk.IIs made them look short. The A6-6T6 is shipped with an integral steel base plate that accepts its included floor spikes. The cabinet, shielded for use in home theaters, is finished in the same matte-black paint found on the A2-300 subwoofer; the finish looks as if it will stand up to some abuse, whereas the vinyl finish of my NEARs, after 12 years and five moves, looks in places a bit worse for the wear. The convex sides of the A6-6T6s cabinet reportedly help reduce internal standing waves. The speakers sturdy grilles didnt seem to affect their sound; I left them on for most of my listening. The A6-6T6 is a three-way speaker with a proprietary 1.3" (33mm) silk-dome tweeter, a 6.3" (162mm) midrange driver, and two 6.3" woofers. The interior of the cabinet is in two sections, the larger to tune the front-ported woofers, the smaller for the rear-ported midrange. On the rear panel is a single pair of five-way binding posts -- no fancy biwiring for these pups. I connected the EDs to my main system: Dual CS5000 turntable with Grado Gold cartridge, Sony X303-ES CD player, Magnum Dynalab Etude FM tuner, and Akai GX-620 reel-to-reel tape deck, all feeding a Linn Majik-IP integrated amplifier; interconnects were a combination of Linn, Straight Wire, and Dayton Audio, and the speaker cables were 14-gauge AR. According to Elementals website, the A6-6T6 is quite sensitive, at 90.3dB (they dont specify at what input and distance). They seemed significantly more sensitive than my NEARs, which are rated at 88dB/2.83V/m. I had to crank up the level control of the A2-300 subwoofer nearly all the way to mate it properly with the A6-6T6s. I placed the A6-6T6s about 5.5 apart, and the A2-300 sub between them; the towers were toed-in about 20 degrees toward my listening position, which was about 6 away. I left them about 20" out from the front wall, but their distance from that wall didnt seem to make much difference. In this way, they were less fussy about setup than nearly any other speaker Ive had in my listening room. I did mention the price, didnt I? Five hundred bucks. For the pair. When I sat down to start taking notes, I was in a rowdy mood. I played "Frankenstein," by the Edgar Winter Group, from the compilation disc Electric 70s (CD, JCI JCD-3302). What amazed me about the EDs from the start, and which this tune brought out to great effect, was the amazingly wide soundstage they created: It seemed to wrap around me by nearly 160 degrees. At the same time, the soundstage wasnt especially deep, but that seems a characteristic of the recording itself. Overall, the EDs sounded a bit mellower than the NEARs. "Then Came You," by the Spinners and Dionne Warwick, from Pure Disco 3 (CD, Polydor 31456 5357-2), also offers a mighty wide soundstage. But when played at very high levels (over 100dB), the songs plentiful highs, mostly from the hi-hats, caused the sound to glaze over and become blurred and indistinct. This didnt happen all the time and ceased as soon as I turned the amp down a few clicks, but these may not be the best speakers for those who prefer stadium sound levels. "You Can Call Me Al," from Paul Simons Graceland (CD, Warner Bros. Archive R2 78904), was reproduced in a manner similar to the other tunes: good, solid bass (from the A6-6T6s on their own, and with the help of the A2-300 subwoofer); slightly mellow, recessed midrange; and smooth highs (so long as I didnt crank the volume too high). The percussive effects in this song sounded crisp and solid. Ive recently been reading Fever: The Life and Music of Miss Peggy Lee, by Peter Richmond, which led me to pull out my copy of The Best of Peggy Lee (CD, Capitol CDP 8 21204 2) to hear her definitive version of "Fever." If youve never heard this track, youve missed a jazz tour de force. Its just Lee, guitarist Howard Roberts on finger snaps (Lee cut his instruments part), bassist Jack Mondragon, and drummer Shelly Manne using his fingers -- no sticks -- on snare and tom-tom. Richmond describes "Fever" as "the sexiest song that Peggy Lee -- or maybe anyone -- ever sang." Through the NEARs, Lees voice comes across as a bit honky; the more subdued character of the A6-6T6s offered a more realistic performance. Again, the soundstage was as broad as the Iowa cornfields, but not as deep as through the NEARs. The sub, and the woofers in the A6-6T6s, gave the bass and bass drum some nice heft. All in all, a fabulous job on a fabulous performance. The rest of my notes on pop and jazz recordings continue in a similar vein. But after spending a good deal of time listening to EDs A6-6T6s with their A2-300 sub, I asked Brett Bell what kind of music Elemental Designs designer, Ben Milne, listens to most often. He said that Milne listens to lots of different kinds of music, depending on his mood, but that if he had to pick one, it would be male singers accompanied by acoustic instruments. That surprised me -- Id found that where the A6-6T6 excelled was with many types of classical music. This came to me while I was reviewing the A2-300. I played Bachs Toccata and Fugue in D Minor to see how well the sub could reproduce the pipe organs pedal notes. The A2-300 certainly did the low bass justice, but the A6-6T6 did a fine job on the rest of the notes. For truly full-range reproduction, the A6-6T6s did need the subs bass reinforcement; by themselves, their bass reproduction was a tad light. There was very good articulation of the keystrokes -- an organ must rely on the acoustics of the room its in for any sustaining of notes; the organ is either on or off. I played Erich Kunzel and the Cincinnati Pops performance of Leopold Stokowskis orchestration of another Bach work, the "Little" Fugue in G Minor, from The Fantastic Stokowski (CD, Telarc CD-80338). With this recording, possibly because it was recorded in Cincinnatis spacious Music Hall, the depth of the A6-6T6s soundstage was greater than with the pop or jazz tracks. The strings were suitably recessed (the Music Hall has a rather dark character with strings), but the flute and other winds were reproduced commendably. Then there was the solidity of the double basses and timpani. Overall, it was very satisfying. I then tried a piece of a very different nature: Leonard Bernsteins overture to Candide, with David Zinman and the Baltimore Symphony Orchestra (CD, London 452 916-2). This time the depth of the soundstage was outstanding, but it was a bit narrower, though still plenty wide. The strings had a very silken sound, while the brass was typically BSO: fairly forward. The contrapuntal snare drum near the pieces end was perfect -- distinct but not too forward -- and the triangle, usually buried among the general hoo-ha at the end, was clearly present and accounted for. Again, a very satisfying performance by the A6-6T6s. I was extremely impressed by Elemental Designs A6-6T6 towers. While their overall sound is refined and works well with jazz and classical, they can still get up and rock -- so long as you dont require break-the-lease sound levels. But if your taste runs to, say, Cerwin-Vega or JBL speakers, the A6-6T6 is not for you. However, if you (as do I) enjoy the sound of British minimonitors, or if your electronics tend toward brightness, the A6-6T6 may be right up your alley. It isnt the Holy Grail of speakers, but at $500/pair its a stone bargain. By all means, check em out.